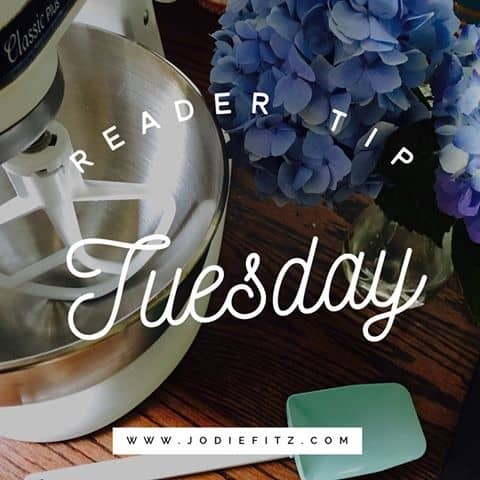 Reader Tip Tuesday is all about you! I truly enjoy hearing how we all make “it” work, whether it be in the kitchen, raising kids, getting creative or building a business. Whatever stage in life, we’re all making something ‘work’ and we all add our unique flair to the many facets of our lives. This party is designed to celebrate YOU and whatever you have going on. So link up a little motivation, your creative works or some delicious recipes. 1. I just love the simplicity & beauty of the table scape created by Rosemary & Thyme. It’s not just the table scape, but the location of it that makes it a winner. Check out the post by clicking here for a zen moment. If I were invited for brunch or lunch, it would be hard to get me to leave (wink). 2. Congratulating North Country Nest on her engagement & wedding planning activities. I love that she’s using flowers from her own garden (and, I L-O-V-E a good love story…I’m glad you were surprised). Click here to Read about everything going on by clicking here. 3. I am definitely inspired by all of the uses of crates & containers that I see on the web. I am also a flower lover, so this combination of an antique bread container & flowers is a winner for me! Thank you Masterpieces of My Life for sharing. Check out all of her container ideas by clicking here. 4. Who doesn’t want one of these? These giant cone of school goodies makes me want to go to school! I may not use this German ShulTute the way it’s intended, but will DEFINITELY be making these for my daughter. Thank you Kid & Kin for this total fun inspiration! Grab all their easy ‘how-to’s’ by clicking here & spread the fun…. NOTE: If you were featured, please grab our button (below) & add it to your post that was featured. Now it’s on to this week’s party. If you’re a blogger please share your creativity, inspirational thoughts & tasty bites by linking up below. Also, please note that we will send you a reminder next Tuesday once the party is live & if you link, you give us permission to use your photo for feature the feature & Reader Tip Tuesday promo of the features. Thank you so much for the feature and kind words this week!! Thank you so much for hosting this week, Jodie! Hi, I’m excited to join this link party! Thanks for the invite. Thank you for inviting me! Happy to join in the link party. Thank you so much for your kind words and for inviting me to join! There are so many inspiring links in the party! Thank you for hosting, great party! Hi Jodie, Thank you so much for hosting! I’ve followed you on Instagram previously – this week I’ve shared my Chocolate Cherry Loaf Cake. Have a lovely weekend! Thanks for hosting again! Enjoy your weekend! Jodie, thanks for the invite to your party. I’ll be busy checking out some of the tips. Have a great week-end. Thanks so much for featuring my riverside tablescape this week. I am so happy and humbled. It was a pleasure joining your fun party.. Great features and stories!! Thank you for hosting.